The release of Inside HBO’s Game of Thrones was a chance for fans the world over to get a closer look behind the scenes at the making of the series, thanks to the writing of series story editor and writer Bryan Cogman having penned the book, filling it with the insights he was able to take from fellow members of the production team and the cast. And now the collector’s edition has been released (Order: Amazon US, Amazon UK), and it adds an additional wrinkle: among the various bits of swag, such as the scrolled maps, is a whole second volume, this one containing storyboards from artist Will Simpson which are a key part of the process of creating and producing the series. To explain more about the books, and what they reveal and what’s contained within, we had the opportunity to interview Bryan so that he can provide a better understanding of what fans can expect to find. You’ve written an episode each season—including for this upcoming season—and now you’ve written the companion guide book for the show. How much work was it to write, compared to a script? Oh, it was much harder. I worked for many years on my own to learn the craft of screenwriting, I have two amazing mentors in David & Dan, I eat, sleep, and breathe movies and TV shows. With this I just dove right in, relying on my memories of other “making of” or “companion” books I pored over when I was a kid. It’s funny—20 years ago, when there was no internet or DVD supplements, these kinds of books really were the average fan’s window into the making of a show or movie—I still have this coffee table book my grandparents gave me for Christmas in 1989—Box Office Champs. It’s completely fallen apart because I read it over and over and over again. But that’s all I had to go on—I’d never done this kind of thing before, had no idea how to start, and had very little time to do it. Thankfully, the folks at Chronicle Books are the best at this sort of volume and they were very helpful. But it took a lot out of me—won’t be doing the next one! Companion books really once were the only way to get these kind of inside insights. The internet certainly has made that a lot easier. That said, Inside HBO’s Game of Thrones brings a lot of new, unique content to the table, I thought. I found the interview excerpts particularly valuable. Were these interviews happening while production was on-going? I can imagine how tough it’d be in the middle of the production to find time to sit down on these. There’s a lot of little anecdotes we’ve never heard of before, which I think fans will appreciate. Did you get to use pretty much everything you got from the interviews? You know, a book just collecting the interviews might be of interest, some day. Was there any aspect of the show that you particularly wanted to draw attention to in writing the book? For me, it’s all the work behind the scenes by the crew that’s the most impressive thing to think about. A lot of man-hours involved in producing those 10 hours we see on the screen. Good question. Not particularly, though maybe I should have! Would have liked to focus more on the artisans—the VFX team, makeup artists, construction, art department, but there really wasn’t time to dig deep into the process in a way that would work for a book. Plus, everyone was busy trying to actually make the TV show. I’m sure there will a number of future books that delve deeper into that sort of thing—and, of course, the Blu Rays do a great job with that. With this book, I suppose I tried to focus on the personal side of things—how the various actors, directors, producers, and crew members connected on a personal level to various scenes, characters, etc… And I definitely wanted it to be user-friendly, in that you could pick it up and go to any random page and find something to enjoy. You definitely can. It’s very nicely organized, breaking down actors and crew according to the various geographic areas the show depicts, which lets you easily move to different groups of actors and also learn about how the looks of those places and the people who inhabit it were established. Did it take long to hit on that structure, or did it just seem the most natural approach for you from the start? No, we decided on that early on. 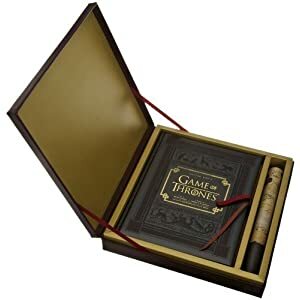 It seemed to be the most fun, and it served one of HBO’s/Chronicle’s requests that there be some mythology info in the book (much of it truncated versions of some of the material I wrote for the S1 bluray). One of the most unique and popular elements of George’s books and the show is the geography so it seemed like the way to go. Another idea I played with was going episode by episode, but I ended up using that for the Storyboard volume in the collectors edition. I’m really looking forward to that one, I have to say. Will Simpson’s storyboards are something we’ve seen glimpses of—you see some of them on the Blu-ray for season 1, as I recall, and I know I saw some when I visited the production offices—but to have a whole book with them is something else. Was that also an idea from early on, to produce that volume for the collector’s set? No, actually, the storyboards were originally going to part of the main book—mixed in with the photography and the concept art. But when we started putting everything together we were presented some problems. One, the book was bursting at the seams, so something had to go. Two, we were having trouble picking which storyboards to use as there was an embarrassment of riches. Three, when we did take a panel or two out of a board… it didn’t have the same impact—it looked like a sketch, whereas if you look at the entire boarded sequence from start to finish—that’s when you really see how they work and why they’re so valuable to the directors and designers. And, finally, they just didn’t look right graphically alongside the photography, the page design/fonts, etc. At first Chronicle wanted to cut them entirely and I begged and pleaded for another solution. Thankfully, Sarah Malarkey at Chronicle hit upon to idea to produce the collectors edition with help from Amazon. But all this happened really fast—we were about to go to press on the first book. I had to write the copy for the second book very quickly, Will had to photocopy and send each board, and Chronicle had to design it, lay it out… but I’m so happy we got it together. In some ways, I’m even more proud of that book. Also, Will’s a good friend, has been since the original pilot, so I was so happy to able to share his work with the masses! Pretty sure the masses share that enthusiasm. The copy on Amazon for the books says we’ll be seeing some “deleted” and “alternate” scenes which were storyboarded but either filmed differently, or never filmed at all. Any particular examples that you can think of, to whet our appetites? Is it organized by episode, then? Oh! There’s the infamous Mad King/Brandon Stark scene. That’s in there. And yes, it’s organized by episode. Some have more than others—Ep 208 (the Prince of Winterfell) is the only one that didn’t feature a single storyboard. What factors could lead to scenes being dropped or maybe changed significantly between storyboarding and filming? Oh, there are all kinds of factors—with season one it was often budgetary. The sacking scene held on for a long time, but we ended up having to lose it. The Mad King flashback was an experiment, but, ultimately it was decided not to go there, as that opens up a whole can of flashback worms. But it was actually shot—most these examples never made it past storyboard stage. Actually, I just realized that I should ask ... just what is the function of storyboarding, anyways? Well, for our show, it’s the first visual representation of our words. It’s essential for the directors who have to pull off dozens of complicated sequences with precious little time. We don’t have the luxury of weeks and weeks for a sequence like you would for a film. So these boards serve as the guide all the way up to and during shooting. Each director works differently with Will and those various differences are explored in the book—each chapter features Will’s reflections on how he worked on each episode. So he’s actually creating these storyboards in collaboration with the directors to some degree? Very interesting! Even more reason to look forward to the book, to get Will’s insights on the process. Yes, and once again, Chronicle produced a beautiful beautiful book—it’s gorgeous, not just a copied portfolio. Does the storyboard results ever lead to changes to the scripts themselves? Like if Will and a director say they can’t find a way to make a scene really work visually. Hmm… I suppose so… Yes, sometimes the director will realize that a certain moment needs to play out a certain way and ask that the script be altered to accommodate. One example of a big collaboration in the final sequence of “What is Dead May Never Die”. At first we only had two days to do the whole thing. At night. With limited child working hours for Maisie. And the location we had to use was very different from the scene I wrote (which played out closer to the version in the book). Plus I found out that I had to work Lommy’s death into it, and the resolution of the Gendry helmet storyline. So Alik Sakharov, Will, and I worked together to completely re-conceive the scene - it went through many many variations. Some of those boards are in the book. Wow. Sometimes you guys scrape by by the skin of your teeth. Some day I’d love to see a timeline of an episode, from start to finish, just to help fans of the show and of television in general just get a sense of how much time and effort goes into each hour. And you’re an HBO show, with the luxury of more time than a lot of network shows have. Then again, Game of Thrones is one of the most ambitious shows on television, too, multiple crews, many locations, huge cast, etc. Well, yeah, all due respect to The Good Wife, but we got bigger fish to fry. Ha! It was my idea, but I don’t remember how it came about. It probably came up in one of the interviews… seemed too fun to leave out. In a way, it’s a bit of a tribute to D&D, who try to keep the set fun in the face of all the obstacles we encounter trying to make this thing. I think that’s a great note to end on. Thanks for the interview, Bryan.